New Delhi: The defence ministry has issued an Expression of Interest (EOI) for shortlisting potential Indian partners and foreign manufacturers for the procurement of 111 Naval Utility Helicopters (NUH) for the Indian Navy in a nearly Rs 22,000 crore contract. 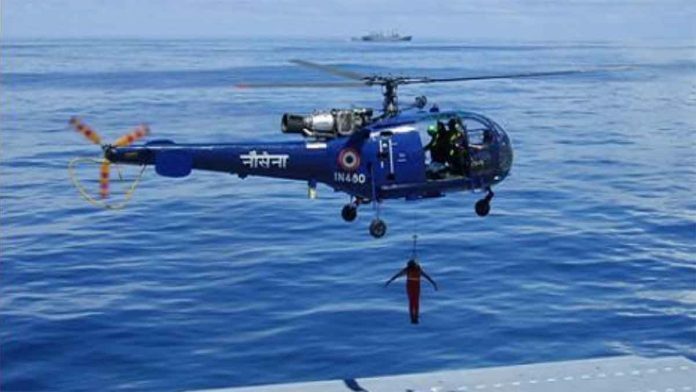 The helicopters will replace Chetak Helicopters and will be utilised for multiple roles, including search and rescue, casualty evacuation and low-intensity maritime operations, besides torpedo drops, said a defence ministry statement Tuesday. Of the 111 helicopters, 95 will be manufactured in India by the selected Indian partner while the rest will be bought off the shelf. The NUH project envisages a high level of indigenisation, with about 60 per cent of each helicopter to be made in the country. Indian firms like Tata Advanced Systems, Mahindra Defence, Adani Defence, L&T, Bharat Forge and Reliance Infrastructure are likely to participate in the process. Lockheed Martin, Airbus Helicopters, Bell Helicopters and RoE are the likely foreign Original Equipment Manufacturers (OEMs) to participate. The Request for Proposal (RFP) for procurement is likely to be issued towards the end of third quarter of this year to the shortlisted Indian companies, said the statement. The Navy has been waiting for the NUHs for years since Chetak is of 1960s vintage. With changing security dynamics, it felt the need to have more reliable twin-engine choppers that can carry out limited anti-submarine warfare as well. The Chetak is a single engine helicopter and is used only when extremely necessary due to risks of flying it over sea. The proposal for the 111 NUHs was approved by Defence Acquisition Council (DAC) on 25 August 2018. The project will provide a major boost to the ‘Make in India’ initiative and fillip to manufacturing capability for helicopters in India, said the statement. While the request for EoI from Indian companies for participating in the project was hosted on the defence ministry and Indian Navy websites Tuesday, those for OEMs has been forwarded to companies that participated in the Request for Information (RFI) deliberations. The OEMs have been mandated to set up dedicated manufacturing line, including design, integration and manufacturing processes for the NUHs in India and make an Indian Manufacturing Line as a global exclusive facility for the NUH platform being offered. While Indian companies have been given two months to respond to the EoI, foreign OEMs have been given three months due to the nature of inputs required. The Indian companies will be shortlisted based on their capability of system integration, facility in the aerospace domain and financial capability.